Facebook has acquired tbh, an iOS app that’s popular among teens for delivering compliments. The company is allowing tbh to operate as it did before, which is similar to how other Facebook acquisitions, like WhatsApp and Instagram, are run. Tbh lets you send prewritten compliments to friends, a method aimed at preventing people from writing nasty comments and cyberbullying. According to tbh, which stands for “to be honest,” over 5 million people have downloaded the app so far and sent over a billion messages since the app was launched in August. Although the app is popular with teens, it can be accessed by anyone. The app presents prewritten compliments like “Could win an Olympic gold medal for their eyeliner game” with four of your phone contacts (others who have also downloaded the app) as possible answers. Answers are anonymous, and whoever you select will get alerted of your choice. 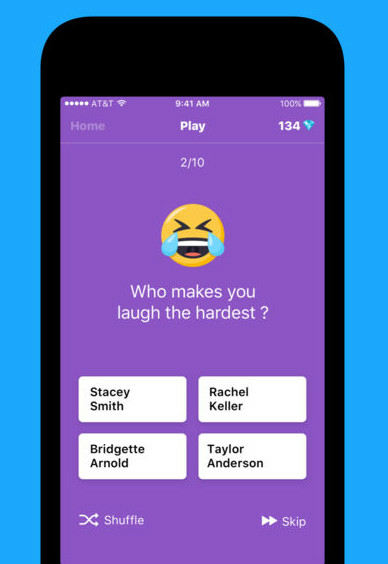 The app includes compliments like “who has the best smile” and “who makes me laugh the hardest,” to help teens feel more validated and positive. The prompts allow tbh to avoid the pitfalls and controversies of anonymous messaging apps like Yik Yak, which shut down back in April. Another anonymous messaging app, Sarahah, has gotten mixed reviews, with some saying that it’s a self-esteem machine, while others point out instances where it’s been used for online bullying. “When we met with Facebook, we realized that we shared many of the same core values about connecting people through positive interactions,” tbh wrote in a statement. According to TechCrunch, Facebook paid under $100 million to acquire tbh, but Facebook did not confirm the number. The app currently doesn’t make any money.